Choosing a finish for a stainless steel project is crucial for ensuring the piece meets the specific needs of your industry and utility. Using a grained finish, or “brushed” look is a common option for residential and commercial stainless steel applications. In this article, we’ll discuss the 3 most common uses for a stainless steel grained finish. Using a grained finish is common for stainless steel pieces used in an area of heavy traffic or heavy use. This material has high integrity against wear and tear and will look good in this state for a long time to come. Because the stainless steel grain has not been buffed out of the metal, it has a dull sheen and is not easily visibly scratched or damaged. This makes it perfect for service elevator wall panels, escalator parts, and more. While stainless steel grain finish is not often used in the manufacturing and production of high grade food or chemical products, it is often used for the protective panels and setup around the machinery. Why? The visible grain of the stainless steel offers room for bacteria and other harmful particulates to gather, which makes it unsuitable for food or chemical manufacturing. However, stainless steel metal with a grain finish offers a sturdy and not easily damaged surface that is perfect for protecting workers throughout the process. Stainless steel grain finish is the perfect material for commercial machinery and equipment that isn’t designed for highly porous materials. 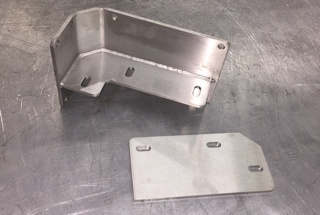 For example, manufacturing equipment for clothing or scientific equipment could use the sturdy structure and integrity of stainless steel, but doesn’t necessarily require the low porosity of hot rolled stainless steel. For this application, a grain finished stainless steel is actually perfect. Highly durable, unlikely to damage the product, and easy to clean, a grain finish offers all of the strength of stainless steel without the expense of a more intense preparation and finish. Common to industrial applications, stainless steel #3 and #4 have a brushed look with a directional stainless steel grain that is easy to spot. Without the shiny or mirrored finish, this metal is often used for commercial or industrial applications because they don’t easily show wear and tear. In more common applications, a stainless steel grain finish is what you’re likely to see used for a kitchen sink, elevator wall panels that aren’t shiny, home kitchen appliances, or for stainless steel floor kick plates. Learn about the various stainless steel finishes in our blog article, “What Are the Options for Stainless Steel Finishes?” then contact our team to get a quote for your next project.